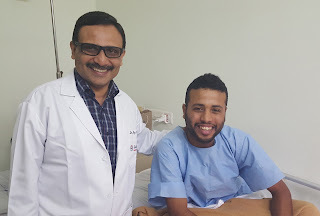 Kochi: Doctors at VPS Lakeshore successfully performed Peroral Endoscopic Myotomy (POEM) on a 24-year-old Oman national, who was finding it difficult to consume solid food for the past four years due to Achalasia, an esophageal motility disorder involving the smooth muscle layer of the esophagus. The patient, Mohammed Khamis, left the hospital on the fourth day after the endoscopy on June 8, 2016, according to the hospital. “Muhammed Khamis can now consume food without any difficulty,” said Dr. Roy J. Mukkada, Senior Consultant and Head of Gastroenterology, VPS Lakeshore who performed POEM on Khamis. VPS Lakeshore was the first hospital in Kerala to begin the endoscopic procedure for treating esophageal motility disorder two years ago, according to hospital authorities. The Achalasia patients are faced with difficulty in swallowing food and chest pain. It can be diagnosed with esophageal manometry and barium x-ray. For treating Achalasia, usually either Laparoscopic Myotomy or Endoscopic Balloon Dilatation is performed. But the patient will have to stay for a longer period in the hospital for recovery and scars of the surgery will remain forever, if Laparoscopic Myotomy is performed. In Endoscopic Balloon Dilatation there are chances of bursting of the esophageal wall and leakage. However, POEM doesn’t have such problems and the patient can consume food on the third day and return home on the fourth day, said Dr. Roy J. Mukkada. Here, you will be greeted with a host of spa & beauty treatments, along with creative & innovative services, for you to look good & feel even better! salon at Dubai for home services and best offer.